Jakob Engblom writes an interesting blog, and two recent entries give a worthwhile perspective on testing. Part 1 and part 2. Win a copy of the book Embedded Software Development for the Internet of Things. The contest runs till the end of March. Daniel McBreaty has a simple way to debug code in PIC-based systems. As I am mostly a hardware guy, most of my embedded stuff is tiny to small. Over the years I have gotten really used to using various incarnations of Microchip's PIC series for my own project - not because they are particularly the greatest, but they have always been good enough, and there has always been one to fit most projects where I have had the choice. Anyway - here is my simple debug setup which serves me well for most projects. Basically I simply use the ICP pins PGD and PGC [see, for instance this for background on those pins] as a debug interface without any extra stuff on the board. As you have to be pretty careful about any load you put on those pins anyway, it usually makes sense to use them like this. It keeps the ICP interface clean and gets double use from those pins. What I do is use one of the two pins as a "bit-bash UART" output, and the other to put the chip in DEBUG mode by pulling low. Rather than having debug print statements as a build option, I have the any debug printf() statement check the DEBUG pin in real time. This way, I can get the chip to start spitting out serial trace info whenever I throw a switch. After I program a new version into the chip, I switch the ICP header to a breakout board that has the UART/USB adapter and the debug switch. I use Chan's xprintf() library here : http://elm-chan.org/fsw/strf/xprintf.html which is great for small projects. Obviously you would remove this for production code, via a compile switch. But when you are working through dev cycles it is great, takes about an hour max to setup, and then just works while you concentrate on getting the project doing everything it should. I first wrote a bit-banging UART for an 8085 in the 1970s. It, like the code above, relied on timing defined by loops. I wonder if anyone has done this using an interrupt-based timer? The C language revolutionized embedded development. Before it gained traction in the 1980s, most developers worked in assembly language. Sure, some PL/M was around as was Forth and a few other lingos, but none had the market share assembly garnered. CPU cycles and memory were in short supply, so the holy grail was efficiency. ... whether that's correct or not. "Good" C code usually runs a 5 to 10% error rate post-compile, once the syntax errors have been removed. Ada programs are about an order of magnitude better. These are typical numbers experienced in practice, not quantities that are indicative of the languages themselves. With the right tools and discipline C bug rates can approach those of Ada. Unfortunately, few developers employ those tools or rigor. Sometimes people mistake my comments about C as a condemnation of the language, rather than a complaint about how we use C. People complain: "It's a poor craftsman who blames his tools." Perhaps Noah could build an ark with nothing more than an adze. Few boatbuilders since have managed such a feat. Today's boat shop is packed with tools, each one exquisitely-designed to fulfill a particular task. Take those away and the builder will find his productivity crumble. It's a demanding craftsman who blames his tools. And then he discards the bad ones, sharpens those that are dull, and adds additional tools where a need exists. C is the embedded community's lingua franca, and will be for a long time to come. Like every language, it's imperfect. The true artisan uses a range of tools to help him create great code efficiently. My biggest regret when buying tools, be they wrenches, saws, or for product development, has been when I bought that cheap model and was inevitably disappointed. Ralph Moore continues his discussion about using the Cortex-M Memory Protection Unit. Here is part 1. As I noted in my previous blog, "Working With the Cortex-M MPU", embedded systems are being drawn into the IoT and thus security in the form of protection of critical system resources is becoming increasingly important. The previous blog discussed how to define MPU regions and Memory Protection Array (MPA) templates using the regions. How these are used to enable MPU operation in a multitasking environment is the subject of this blog. 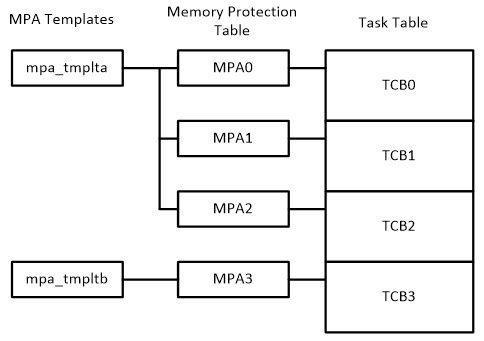 To the left of TT is the Memory Protection Table (MPT). This table has a Memory Protection Array (MPA) for each task. MPAs are in the same order as TCBs and each TCB contains an index into MPT to access its MPA. A task's MPA is loaded into the MPU when the task is dispatched. Thus, each task has its own set of regions when it is running The overhead on task switching time is about 25% for an MPA with 5 regions..
To the left of MPT, in the above figure, two MPA templates are shown. How to create MPA templates was covered in my previous blog. Note that tmplta is shared between three MPAs and hence it is shared between three tasks. These tasks comprise a group of tasks that share code and data and are probably part of a subsystem, such as networking or file I/O. Such a task group is comparable to a process in a GPOS system. In a GPOS system processes typically use a Memory Management Unit (MMU) to provide isolation and protection. Here tasks use an MPU for the same purposes. Also shown, tmpltb is used by one MPA and hence by one task. 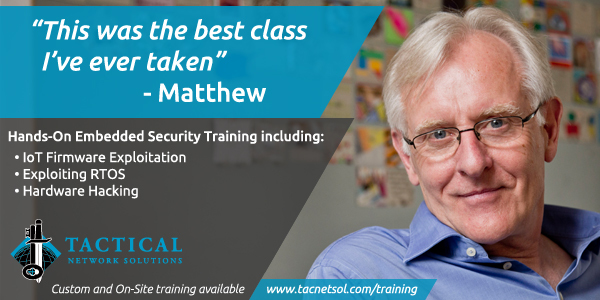 This solitary task can be isolated and protected from all other tasks in the system. The MPU background region is like a flood – it breaks down all the barriers in pmode. Consequently, any ptask can access any other ptask's code and data, and even handler and ISR code and data. Also, there is no overflow detection. This is no good. For this reason, I have implemented background region switching. This consists of defining two system regions: sys_code and sys_data. These privileged regions are permanently present in MPU and MPU, respectively. Thus, they are present for all tasks and have higher priority than task regions so that overlapping task regions cannot override them. MPU_BR_ON() turns the background region ON for handlers and ISRs. MPU_BR_OFF() turns it OFF if the RETTOBASE processor flag is 1 and mpu_br_off global flag is true. The former means that the handler or ISR is not nested and the latter means that the task about to run does not use background mode. mpu_br_off is set when a task is dispatched and its mpav flag is true. A task's mpav flag is set when its MPA is loaded. Each of the above macros is just a few lines of code and add minimal overhead to a handler or ISR. If a handler or an ISR can be entirely contained within sys_code and sys_data, these macros can be omitted - i.e. background region is not turned on for them. Now ptasks can be isolated from other ptasks and handlers and ISRs can be isolated from ptasks. This improves system reliability and is an important stepping stone on the path to utasks. The final MPU structure and a step-by-step procedure to convert existing software to MPU protection will be presented in my next blog. Kevin Wible passed along this article about a very simple and clever wide dynamic range ammeter that uses the Shockley diode equation to give a logarithmic result. The oscilloscope market has been revolutionized by decent-quality, very low-cost scopes from China. Siglent, Rigol and others offer products with tremendous value for amazing prices. I've wondered how my two favorite scope companies, Tektronix and Keysight (née Agilent, née HP) could compete. Turns out, they can attack on price. Keysight is now offering what appears to be really decent scopes for $450 and up. Several vendors have 3D NAND flash products now. It's quite amazing technology and paints a direction for the continuation of Moore's Law once we stumble into atomic dimensions. Toshiba recently announced a near-term 1TB flash device. It will be a stack of 16 dies using 3-bit MLC. That's a lot of transistors in one package! The physicist is next. He creates a circular fence of infinite radius around the sheep, and then draws the fence tight around the herd, declaring, "This will give the smallest circular fence around the herd." The mathematician is last. After giving the problem a little thought, he puts a small fence around himself and then declares, "I define myself to be on the outside."